Eliminating heat is this tanks best quality - thankfully it brings the flavor bigtime. The uForce is rapidly growing in popularity. Unlike most tanks which tend to settle for the tried and true dual channel airflow design, the Voopoo Uforce takes it up a notch and increases airflow by a good 30% with their triple channel airflow slots, allowing for more air to pass through. The increased airflow definitely makes a difference in cloud production but still manages to stay smooth without any noticeable turbulence or annoying whistling regardless of airflow setting. Voopoo has been making huge waves this year with their successful release of the Drag, a budget mod featuring capabilities on par with expensive DNA devices. Now it's time for them to dip their toes into the atomizer market with the all-new Uforce sub-ohm tank. Boasting a 24.6mm diameter base, this tank has the potential brawn to go against the heavy hitters such as the TFV12. The Uforce is promising a fresh new airflow design which is supposed to channel heat away from the tank more effectively without any compromise in vaping performance. Let's get down and dirty with the details of the Uforce and see if it's truly an atomizer worthy of the books. Just based on looks alone, the Uforce is the paragon of simplicity with its no-nonsense design. By no means does that mean that it's not a looker though as the craftsmanship and high-quality materials used to construct the tank are evident by just a simple glance. With chrome accents used to give a touch of class to the base of the tank, the elegant stainless steel design manages to stand out, even more, especially thanks to the large variety of available colorways that look wonderfully vibrant even to the untrained eye. The glass tube used to hold the e-liquid is constructed out of durable Pyrex glass, so while it might not 100% drop-proof, it still manages to eke out other tanks in terms of durability. Tolerances on the tank are tight meaning everything from the sliding mechanism on the top cap to the adjustable airflow ring at the bottom feels buttery smooth when adjusted or opened. The stainless steel threading used for the 510 pin is machined perfectly, effectively eliminating any potential snags or crunches when threading the tank into your device of choice. The 510 also uses a gold plated contact pin which definitely helps in ensuring a cleaner and more secure connection between the tank and mod so that no issues with atomizer resistance or misfiring take occur. The Voopoo Uforce tank kit comes packaged with a Uforce U2 dual coil head rated at 0.4 ohms as well as a U4 quadruple coil head rated at 0.23 ohms. Both claim to be wicked with organic cotton and it does seem to be the case as flavors on either of these coils are phenomenal. Flavors come through clean and crisp without any distracting aftertaste. The wicking channels also do a great job of keeping the wicks fully saturated with e-liquid as chain vaping with the Uforce at 70 watts doesn't produce any nasty dry hits. As for differences between the two included coil heads, the U2 manages to prioritize flavor over vapor production while the U4 is an absolute beast at cloud chucking. Coil durability is on par with other well-known high-quality offerings from Smok, Vaporesso, or Eleaf, and each coil manages to last over a week before needing replacement or cleaning. 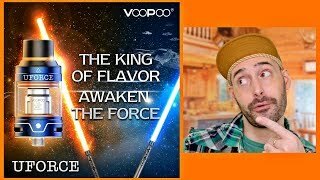 While Voopoo is a relatively new contender in the atomizer market, they've managed to use the same thoughtful design and excellent craftsmanship present in the Voopoo Drag and carry that over to creating the Voopoo Uforce. The excellent airflow design manages to rival the best flagship tanks in the market and it also doesn't fall behind in terms of features such as the easy to use sliding mechanism on the top cap. Lastly, the high-quality coil heads manage to deliver lots of flavor and vapor with every hit and have enough durability to be a great economical option for any vaper.